Forget florals, norm core, and Americana …..Fashion’s gone all TECHNICAL this week. A lady’s handbag is traditional filled with junk, a lipstick covered in biscuit crumbs, a compact, tissues perhaps, a magazine, change of knickers…… Well not anymore. Handbag brand Jam Love has collaborated with VeryFirstTo to launch “The Ultimate Handbag” a Travel Tote filled with the five modern day essentials. 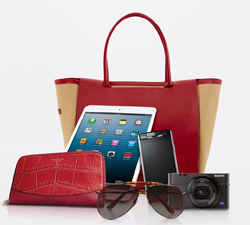 The bag contains: a Signature Touch phone, Burberry Contrast Leather Ziparound wallet, iPad Air, Sony Cyber-shot RX100 III camera and Gucci sunglasses. It’s available on its own for £450 or with the items for £10,325. Includes: pockets for users phone, purse and keys and a sleeve for a laptop or tablet that is attached with leather leaves. Meanwhile…fitness bands are like, so yesterday…. Ralph Lauren unveiled a high-performance, fashion-forward Polo Tech shirt on opening day of the US Open. The Polo Tech shirt merges biometrics into apparel, and aims to improve general wellness and increase personal fitness.